This classic Swedish novel envisioned a future of drab terror. 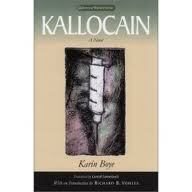 Seen through the eyes of idealistic scientist Leo Kall, Kallocain’s depiction of a totalitarian world state is a montage of what novelist Karin Boye had seen or sensed in 1930s Russia and Germany. Its central idea grew from the rumors of truth drugs that ensured the subservience of every citizen to the state. I finished Kallocain by Swedish author Karin Boye last night and the first word that springs to mind for this novel is insidious. Not insidious to the reader per se, but insidious to the reader in regards to the characters. It’s strange, even though I have read several Dystopia novels, this one seems to get under my skin. The content is both upfront and subtle. The reason I say that is because it is in the same vein as 1984 and Brave New World, but both those novels *spoiler alert* have such a violent end *end of spoiler* whereas Kallocain is more like an awakening. It’s a steady awakening for the main character (Kall) throughout the novel and that’s also true of Brave New World and 1984, but with those two I found myself disgusted with the mental conditioning. The reason I say Kallocain is insidious is because I find myself wishing the characters would not awaken and would still go along in the same humdrum, non individualistic way of before. It doesn’t have as beautiful an ending to it as Brave New World did to me and it isn’t as sorrowful as 1984 is, but it’s still worth the read, even more so if you’re a fan of Dystopia. It’s a novel that can easily be appreciated for it’s language and idea especially in it’s genre. There isn’t any detail to how the world got that way or how they mentally condition people as it’s more introspective and placing emphasis on that one person, his obsession with the community, and his measurements of people around him. It’s almost a light read, but at the same time it’s quite in-depth character wise. I don’t know, that’s probably not a very good review of the my reading experience or the story or the character work up, but it’s one of those books you just need to read and form your own opinion on because I can really just sum it all up in three words if need be: insidious, introspective, and subtle. Demographic: Adult, but possibly suitable for an older young adult. Reminds Me Of: It definitely had a 1984 and a Brave New World feel to it. ← Do You Love Your Library?